Infinitap Games • More Color to Cell Doors in the Asylum Level? The official forums for Infinitap Games. More Color to Cell Doors in the Asylum Level? 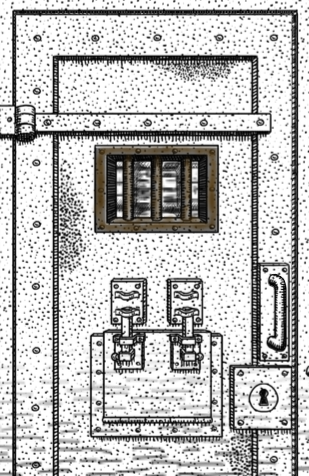 Re: More Color to Cell Doors in the Asylum Level? I like it, especially the upper one with the more pronounced rust spots. Heck, one might even confuse parts of it for a blood smear, which is not the worst that can happen in a game like this. Yeah, I like the top one too. I was wondering if it would be a good fit, the rest of the place seems fairly sterile apart from the recent damage, so just tossing that out as a possible idea. gagaplex wrote: I like it, especially the upper one with the more pronounced rust spots. Heck, one might even confuse parts of it for a blood smear, which is not the worst that can happen in a game like this. Oh, that's a good idea, using some well placed blood spots to draw attention to the doors. RightClickSaveAs wrote: Oh, that's a good idea, using some well placed blood spots to draw attention to the doors. The problem with that is that eventually EVERYTHING gets covered in blood, so it would stand out towards the beginning, but kind of blend into the background as the level goes on. I think a color distinct from the blood is the best way to go, like a brass sort of color similar to doorknobs, or maybe a greenish color like oxidized bronze to contrast all the red, but I'm interested in what the artists come up with. I'm not sure blood would do it since there is a lot of blood in the game, so people kind of block it out. We are also trying to do a progression of blood as you play through the asylum level, so it would conflict with some of our art goals. I talked to Joe, so we are on it. It's a tough problem to solve, but we'll do our best. I didn't even know you could interact with the doors until someone said something about it on the forum. Our palette is ONLY black and white (no greyscale), so grey means interactive even if it. We did grey doors on the ice box with the milk, and I was worried that people might have problems with the ice box since it's a silver door - for similar reasons, but no one seems to have problems with that. We had to do a lot of versions on the ice box to get something we thought worked... At least we succeeded there. That could be a cause of the problem. Seeing as how I'd played that section before, I guess I wasn't really looking at the doors. To be honest, I've only recently discovered that the meatgrinder can also be examined for the same reason. It didn't stand out enough from the background, so I assumed it was also a static entity that I couldn't interact with and only happened to try checking it on a whim because it had blood on it. That being said, I also realize making every single intractable item stand out like a sore thumb might not be the best idea either, depending on how important it is. matt wrote: Our palette is ONLY black and white (no greyscale), so grey means interactive even if it. We did grey doors on the ice box with the milk, and I was worried that people might have problems with the ice box since it's a silver door - for similar reasons, but no one seems to have problems with that. We had to do a lot of versions on the ice box to get something we thought worked... At least we succeeded there. I think the icebox works because players were almost explicitly told that the icebox was the objective they were seeking, so it didn't need to stand out as much. Perhaps it's just me reading too much into mechanics I didn't fully understand. I guess grey didn't stand out too much from the background, so maybe I subconsciously ignored those objects. Knowing that, I'll pay more attention to object color from now on.